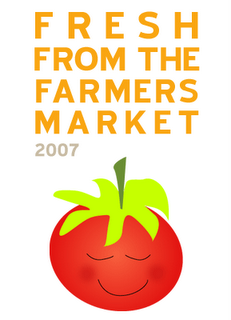 A little while ago, Alanna of A Veggie Venture, asked me to come up with an icon for her blog. But it wouldn’t just be any icon, it would be a button to share with other food bloggers wishing to mark their recent farmer’s market visit & forthcoming recipes with something extra-special! So I came up with this li’l illustration of a cutie-pie tomato. The next time you cook with fresh ingredients and want to write about it on your blog, mark your post with this little fresh tomato! See Alanna’s post for details. You are so talented! I’m really envious of anyone who can create something so cute. I’m going to definitely use the icon–it’s too adorable not to! how adorable! my favorite farmers market opens mid-June, I’ll be using this lots this summer! that is the sweetest tomato EVER! I love it. I bet everyone will start using it all over, it will be a celebrity tomato in no time. Amazingly adorable. This is a great idea. That’s the cutest produce I’ve ever seen outside of Veggie Tales! Really love the icon, thanks!